'It's A Big One': Iowa Pipeline Leaks Nearly 140,000 Gallons Of Diesel : The Two-Way The leak from an underground pipeline in north-central Iowa was first discovered in a field on Wednesday morning. Crews for the company, Magellan Midstream Partners, are working to clean it up. 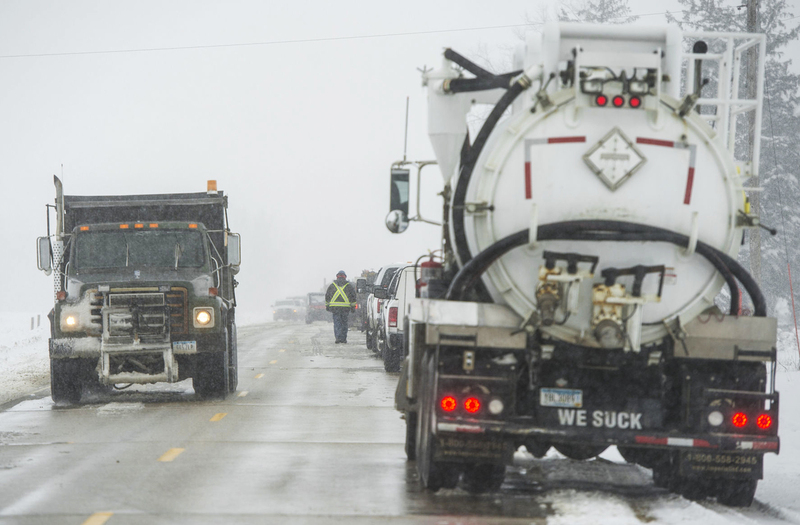 Crews clean up the diesel fuel spill after a pipeline broke in Worth County, Iowa on Wednesday. An underground pipeline that runs through multiple Midwestern states has leaked an estimated 138,000 gallons of diesel fuel, according to the company that owns it, Magellan Midstream Partners. Clay Masters of Iowa Public Radio reported diesel leaking from a 12-inch underground pipe was initially spotted in a farm field in north-central Worth County, Iowa, on Wednesday morning. Officials from the U.S. Environmental Protection Agency and Iowa Department of Natural Resources joined representatives of Magellan and other local officials at the site, Masters reported. "It's a big one — it's significant," Jeff Vansteenburg of the Iowa Department of Natural Resources told the Des Moines Register. "The product is under pressure, so as soon as a leak develops, it starts coming out pretty fast," Vansteenburg said at a Wednesday evening news conference. "Vacuum trucks are sucking up as much liquid as they can and taking that down to Magellan's terminal. ... Once they've recovered all the free product that they can then they will go in and remove contaminated soil." Vansteenburg said the diesel had not reached nearby Willow Creek or a wildlife protection area. A safety plan submitted by the company to the U.S. Department of Transportation in 2014 lists the pipeline, which runs through Illinois, Iowa, Minnesota, North Dakota, South Dakota and Wisconsin, as a transport route for multiple refined oil products, "including Diesel, Gasoline, Jet fuel, Natural gasoline, Naptha, Propane, Natural Gas, Butane." Maps of the pipeline were redacted from the public version of the report. The leak occurred when the pipeline ruptured and diesel sprayed out, a spokesperson for the Iowa Department of Natural Resources told the Register. More than a foot of snow has fallen since Monday in some parts of north-central Iowa. As of Wednesday afternoon, cleanup crews had sucked up "about 25,000 gallons of diesel and a slush-diesel mixture," reported the Globe Gazette newspaper in Mason City, Iowa. Another pipeline operated by Magellan leaked near Decatur, Neb., last October, according to the Omaha World-Herald, which reported that a ruptured pipe carrying anhydrous ammonia killed one person and led to the evacuation of 23 households. In 2010, the company agreed to pay a $46,200 penalty for violating the Clean Water Act, after an estimated 5,000 gallons of diesel spilled into a creek near Milford, Iowa. That year, Magellan was also fined $418,000 for a 45,000-gallon gasoline spill in Oklahoma. In November, the company temporarily shut down its pipelines in order to inspect them after an earthquake in Cushing, Okla., damaged several buildings, as we reported. As the public media project Inside Energy has reported, "According to data from federal regulators, there is actually a low probability of a pipeline accident. But when there is an accident, the impact can be huge." The project also created a map of all the pipeline spills reported since 2010. "According to PHMSA, the agency has 533 inspectors on its payroll. That works out to around one inspector for every 5,000 miles of pipe. A government audit in October  found that that PHMSA is behind on implementing new rules. It has 41 mandates and recommendations related to pipeline safety that await rulemaking." The PHMSA makes searchable information about where pipelines are in the U.S., broken down by county, available at its website.